The country of origin of the Wenzhou mandarin orange is Kagoshima Prefecture in Japan. It is a fruit that represents Japan from of old. In general, if winter comes, a lot of spectacles of eating the mandarin orange with the kotatsu are seen. The Wenzhou mandarin orange (The orange and the scientific name are Citrus unshyu) indicates the tree or the fruits by rue family's evergreen bush. There are a lot of cultivars, and it is used chiefly as for food. This photograph is a orange. Wenzhou is Wenzhou in Chinese Chechiang province. The mandarin orange is especially famous because vitamin C is abundant. It is said that vitamin C for an adult day can replenish it by about two mandarin oranges. Vitamin C is safe because it is harmless even if it takes it a lot even if a lot of eating. A lot of vitamins A and P are contained as other nutrients. Vitamin A is a β carotene. It is said that a lot of β cryptoxanthins that are are effective against cancer from the orange. The β cryptoxanthin is included by 1-2mg a mandarin orange in an orange coloring matter of the mandarin orange. The mandarin orange is effective in the cold and the obesity prevention. It is thought that it becomes difficult to catch a cold if it eats the mandarin orange from my experience. Vitamin C and vitamin A of this are very abundant in mandarin orangeVitamin C and vitamin A enhance immune function, and the resistance power of the body is increased. It is because the synephrine besides vitamin C is included in the mandarin orange though said working for the cold when it eats the mandarin orange. Especially a lot of this synephrines seem to be in the Wenzhou mandarin orange system. A lot of synephrines are included in the mandarin orange with an especially blue immaturity in the acidity element of the mandarin orange. The synephrine makes fat combustible, and is said that it is effective in prevention and dieting of obesity because there is an effect of the promotion of metabolizing of fat and decreasing the body fat. The carotene of the mandarin orange prevents arteriosclerosis. A lot of amounts can be easily taken by making it to the mandarin orange juice though it is acceptable only to eat the mandarin orange because the carotene of the mandarin orange (carotene) prevents arteriosclerosis. I think that it is also good for health to take the sour one though it is usual that the mandarin orange juice of 100% is very sour. The sour one is and the hated person occasionally exists healthily the problem. 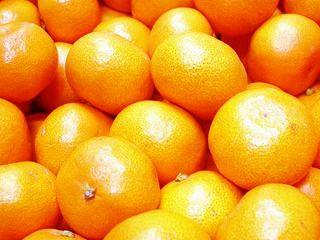 There is working that makes the vessel wall strong in vitamin P.
The mandarin orange is working that a lot of dietary fibers are made beautiful in intestines, and prevents the large intestine cancer etc.As for the dietary fiber, the effect is improved by taking it with vitamin A and P.
The overeating of the mandarin orange has been noted. It is very delicious, and note the overeating even very much about the mandarin orange, please though it is possible to eat. The face and hands and feet yellow just like the pumpkin when eating too much too much. There are a lot of calories and it grows fat when a lot of eating because it contains a lot of sugar. Weight increases by the mandarin orange and the persimmon when I become the autumn of every year. However, a healthy effect is larger. The skin of the mandarin orange is a Chinese medicine that is called Citrus Unshiu Peel. The skin of the mandarin orange is dried for one week or more because of shade and it is dried. If it is put in the bathtub, the active ingredient of vitamin A and C becomes prevention of the cold. Seki is stopped to the skin of the mandarin orange, phlegm is excluded, and there is working that cancels nausea. The skin 10g of a dry mandarin orange is infused until becoming a half amount by the water of 500-600ml. This is drunk ,divided into a day three portions. You may add honey. The mandarin orange uses the one that wax is not painted on the epidermal. When the mandarin orange is frozen as it is, it dries. It soaks to water after it freezes suddenly to prevent dryness, the film of ice is made outside, and the mandarin orange is prevented being dried. The washed orange is put in the freezer and it freezes to make the frozen mandarin orange at home. The mandarin orange frozen once is made and the film of peculiar ice to the frozen mandarin orange can be made in water again by quickly passing by freezing with the freezer again. To make a lot of bought mandarin oranges last long, it arranges without paving newspaper in the room where the temperature to which heating doesn't work doesn't go up and piling up the mandarin orange and it puts it. It throws it away at once if there is a thing awfully worn out in that. If it is extent that hurts a little, it eats ahead of time. The window of the room is sometimes opened and it ventilates it.